Federal ammunition is one of the most trusted names in ammunition. They consistently provide the highest quality products for shooters. 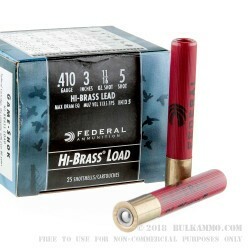 The .410 Game Shok ammo from federal will not disappoint. These are affordable loads that are meant to match a variety of small game and upland game hunting situations. 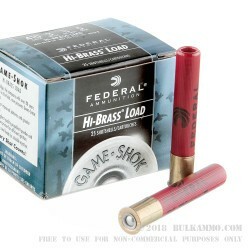 This shotgun ammunition is a three-inch shell with a high brass load. This means that the shell is more powerful than a traditional load. So they are better to use for hunting small game. The muzzle velocity for these rounds is 1135 feet per second. Also, the #5 shot is the perfect pellet size for rabbits, squirrels, and other upland game. As it will do enough damage to the animal without ruining the meat. 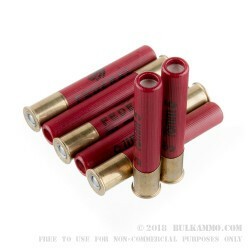 These shotgun shells are sold with 25 rounds per box. 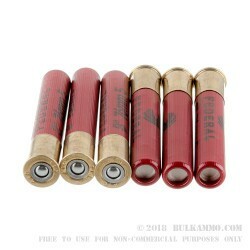 They are the perfect choice for a small game hunter that shoots a .410 shotgun. They are affordable so you can purchase a lot of rounds for fast action shooting like small game. They also provide you with the speed and knockdown power necessary for small game hunting.